The Galion girls and boys track and field teams returned from Mount Gilead Thursday after winning the Mid Ohio Athletic Conference Red Division Championship. The Tigers won with 158 points, while the Lady Tigers won with 141.5 points. For the boys, River Valley placed second with 117 points, followed by Marion Harding (81.5), Buckeye Valley (80), Fairbanks (73), Pleasant (60.5), North Union (55) and Jonathan Alder (33). Taking first individually were Colin McCullough (110, 300 meter hurdles), Drake Barnett (200 meter dash), Colton Moore (high jump), Houston Blair (long jump), Gavin Ratcliff (discuss throw) and Jacob Staiger (shot put). Drake Barnett, Takoda Crisman, Khennter Hughes and Jacob Fryer won in the 4×100 relay in 44.04. For the girls, Pleasant placed second with 109.5 points, followed by Buckeye Valley (94), River Valley (82.5), Jonathan Alder (76), Fairbanks (72), Marion Harding (51) and North Union (25.5). Marisa Gwinner won first place in the high jump (5-feet-5), while Sydney Hunt took the gold in the long jump (16-feet-5). Dani Court notched the top spot in the discuss throw. The girls 4×200 meter and 4×100 relay teams, which both consisted of Patience Dowden, Jalyn Oswald, Marisa Gwinner and Sydney Hunt, won in 1:49.01 and 51.8, respectively. Mount Gilead swept the team titles in the Blue Division championship of the Mid-Ohio Athletic Conference track meet on Thursday, with Northmor finishing second in both the boys’ and girls’ competitions. The Lady Indians cruised to their win, scoring 164.5 points. Northmor was second with 124 points, while Cardington took third with 80.5 and Highland had 75. For the Lady Knights, Maria Lee won the 1600 in 5:34.31 to highlight their Thursday effort. Vivenne Cutrupi, Rachel Morrison, Brooke Bennett and Samantha Peters teamed up to take second in the 1600 relay. The boys’ meet was more closely contested, as the Indians battled back from a Tuesday deficit to edge Northmor by a 157.5 to 145 margin for the championship. For Northmor, Demetrius Johnson had a big day. He won the 200 in 22.98 and the 400 in 51.89, while also placing second in the 100. 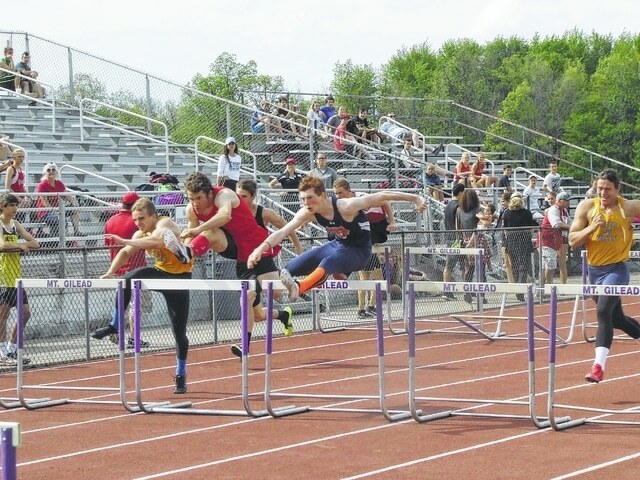 Collin Berg was second in the 300 hurdles and third in the 110 hurdles, while Kolton Smith took second in the 110s. The 1600-meter relay team of Drew Zoll, Berg, Alec Moore and James Walker was third, while Walker also placed third in the 300 hurdles. Rob Hamilton contributed to this report. Galion’s Collin McCullough takes first in the 110, 300 meter hurdles at the Mid Ohio Athletic Conference Red Division Championship on May 12. The Tigers won with 158 points, while the girls won 141.5 points.